Fish oil is a dietary supplement available in liquid, softgel and capsule form and contains a considerable amount of omega-3 fatty acids. According to MayoClinic.com, the DHA and EPA compounds found in fish oil have been clinically proven to lower triglyceride in the body while reducing the risk of death, heart attack and strokes. While some consumers opt to take their fish oil in liquid form rather than capsules, both types will turn rancid and lose their beneficial properties after three months. Inspect the label of your fish oil capsule or softgel product for specific storing instructions. 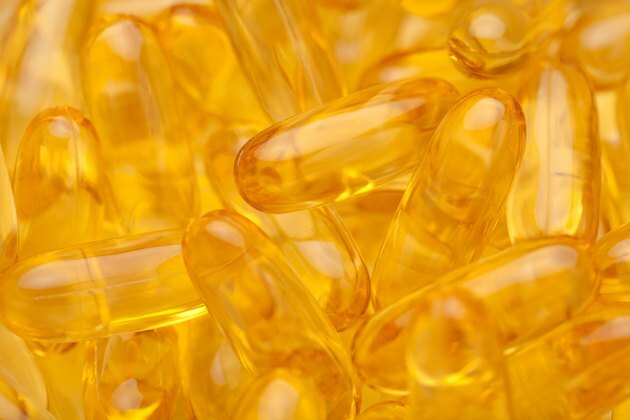 According to the Spectrum Organics fish oil manufacturer, capsule containers can be kept at room temperature until they're opened, after which they should be refrigerated. Locate the temperature gauge or program interface inside your refrigerator for raising or lowering the temperature. Adjust the settings so the inside of the refrigerator is kept at least 39 degrees F or colder. Place your fish oil capsule container in the refrigerator immediately after opening. Make sure the lid has been tightly sealed and is as close to airtight as possible. Reduce the amount of time your fish oil sits outside of the refrigerator when taking the capsules to help prolong shelf life. Keep the fish oil capsules stored up to 90 days from the time you first opened the container. Throw out any remaining capsules after 90 days to reduce the chance of consuming rancid capsules. Calculate three months from the date that you open the fish oil capsule container and write this date down on the lid to limit your chance of consuming expired oil. If you do not have the container the capsules originally came in, select a zip-lock bag or sealable plastic container to store the capsules in the refrigerator. Contact your doctor or personal physician before placing yourself on a fish oil dietary supplement to limit your chance of an allergic reaction or other negative side effects. Do Fish Oil Softgels Expire? Can You Take Omega-3 Fish Oil With a Multivitamin? When Is Fish Oil Rancid?